This little interchange makes me curious. What significant thing was going on in Nathaneal's* mind or heart while he was sitting under the fig tree? It mist have been important for Jesus' mere mention of it to change his attitude from cynicism to worship. You understand my thought afar of. And are acquainted with all my ways" - Psalm 139:2,3. It's easy to lose sight of God's intimate knowledge of us—until something reminds us. Something like the verse we notice in our Sunday devotions is the exact verse on which our pastor preaches, or God answers our prayer pointedly and directly. I love the answered-prayer story Kim Collingsworth tells on the "A Decade of Memories" DVD. In 2000 Phil and Kim Collingsworth quit their jobs and and began a full-time family singing ministry. One evening in the early days, after putting the kids to bed, Phil told Kim the sobering news. They were short $300 to pay the bills that month. "It might as well have been $3,000 it seemed like so much to us," Kim relates. What to do? All they could do was pray. They did, asking God to supply their specific need. The next morning when Kim went to get the mail, there was a pink envelope from someone they knew but hadn't heard from in years. In it was a cute card and, you guessed it, a check for $300! An elderly friend said she had been impressed to send them this money and hoped they could use it. Let's be encouraged that God knows us just as well. Don't be surprised if He gives you your own "… when-you-were-under-the-fig-tree-I-saw-you" experience! PRAYER: Dear Jesus, thank You for how intimately and completely You know me. Help me to follow in the train of Nathaneal, to whom You promised, "Because I said to you, 'I saw you under the fig tree,' do you believe? You will see greater things than these!'" Amen. John the Baptist's words in John 1:29 of our reading are part of Handel's Messiah—the beautiful chorus "Behold the Lamb of God" performed by the London Philharmonic Orchestra and Chorus. 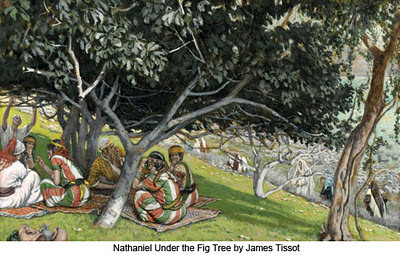 Love this fig tree story, Violet, because it's such a personal connection for Nathaniel. I'm told the fig tree was often a place of private worship. Whatever Nathaniel said to the Lord in private, Jesus' words let him know had been heard. And as you say, He does that for us too. Wonderful!